Market intelligence provider IDC has released a report detailing the state of the worldwide traditional PC market for the first quarter of 2018 (1Q18). 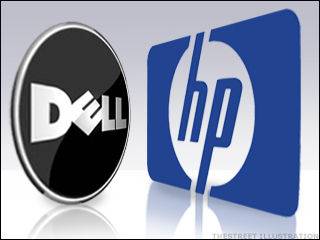 According to the data, both Dell and HP have seen increases in market share in comparison to the first quarter of 2017 (1Q17). However, the total of global PC shipments for the quarter has experienced a flat year-on-year growth. 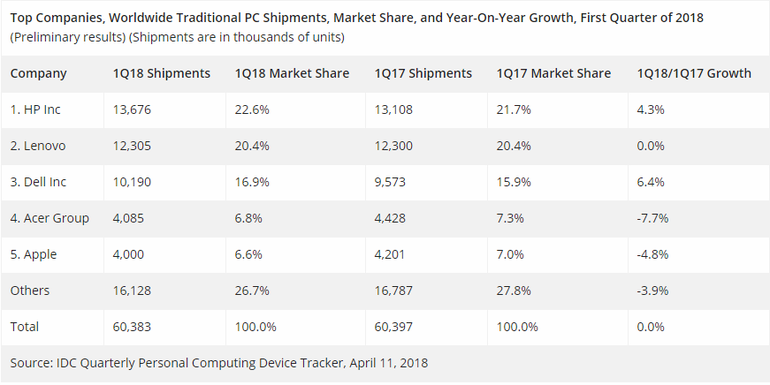 A new report from analysts IDC has offered up some interesting information in regard to the traditional PC market (which includes desktops, notebooks, and workstations). HP is the market leader in 1Q18, with 13.6 million units shipped and 22.6% of the market share. The 1Q17 figures for the California-based manufacturer were 13.1 million units shipped and 21.7% market share, so the company has enjoyed growth in a market that is expected to decline in the long term. Dell has also seen an improvement in market share, with figures rising from 15.9% in 1Q17 to 16.9% in 1Q18. According to IDC, the top five companies in order of market share and units shipped were HP, Lenovo, Dell, Acer, and Apple; however, Lenovo’s growth was 0.0%, whilst both Acer and Apple experienced declines. Over 60.3 million traditional PCs were shipped for the quarter. Tablets were not included in IDC’s estimates.